Are E-Cigs Just as Bad as Tobacco? Kadimisetty with the 3-D printed sample chamber of his genetic toxicity testing device. A study by chemists at the University of Connecticut offers new evidence that electronic cigarettes, or e-cigarettes, are potentially as harmful as tobacco cigarettes. Using a new low-cost, 3-D printed testing device, UConn researchers found that e-cigarettes loaded with a nicotine-based liquid are potentially as harmful as unfiltered cigarettes when it comes to causing DNA damage. The researchers also found that vapor from non-nicotine e-cigarettes caused as much DNA damage as filtered cigarettes, possibly due to the many chemical additives present in e-cigarette vapors. Cellular mutations caused by DNA damage can lead to cancer. The findings appear in the journal ACS Sensors. How much DNA damage e-cigarettes cause depends on the amount of vapor the user inhales, the other additives present, whether nicotine or non-nicotine liquid is used, and other factors, says Karteek Kadimisetty, a postdoctoral researcher in UConn’s chemistry department and the study’s lead author. But one finding was clear. 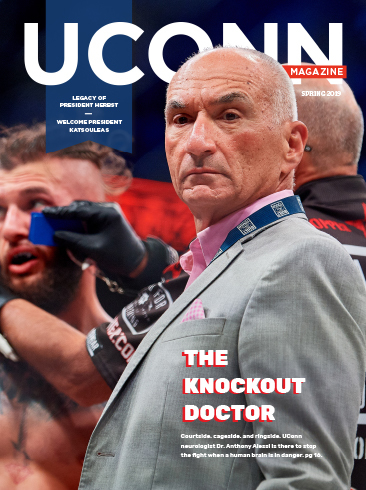 “From the results of our study, we can conclude that e-cigarettes have as much potential to cause DNA damage as unfiltered regular cigarettes,” Kadimisetty says. Electronic cigarettes are battery-powered devices that heat up liquid and turn it into an aerosol vapor that can be inhaled. Using e-cigarettes is also called ‘vaping.’ The contents of e-cigarettes, called e-liquid or e-juice, are usually made up of propylene glycol, glycerine, nicotine, and flavorings such as menthol, cherry, vanilla, or mint. Non-nicotine e-cigarettes are also available. Frequently viewed as a less toxic alternative for people looking to break their habit of smoking tobacco cigarettes, modern e-cigarettes have steadily risen in popularity since they first appeared on the commercial market in 2004. How much e-cigarettes contribute to serious health problems and whether they serve as a gateway for future tobacco smokers remains the subject of much debate. Growing concerns about the potential health impact of electronic cigarettes however, prompted the U.S. Food and Drug Administration to tighten its regulation of e-cigarettes in 2016. UConn’s scientists decided to look into whether the chemicals in e-cigarettes could cause damage to human DNA while testing a new electro-optical screening device they developed in their lab. The small 3-D printed device is believed to be the first of its kind capable of quickly detecting DNA damage, or genotoxicity, in environmental samples in the field, the researchers say. The device uses micropumps to push liquid samples across multiple ‘microwells’ embedded in a small carbon chip. The wells are pre-loaded with reactive human metabolic enzymes and DNA. As the samples drop into the wells, new metabolites that have the potential to cause DNA damage are formed. Reactions between the metabolites and the DNA generate light that is captured by a camera. Within five minutes, users can see how much relative DNA damage a sample produces by the intensity of the light detected in each well. The device is unique in that it converts chemicals into their metabolites during testing, which replicates what happens in the human body, Kadimisetty says. Bioassays currently used to determine the genotoxicity of environmental samples may be more comprehensive, but they are also time-consuming and costly. The lab equipment alone can cost tens of thousands of dollars. The array developed at UConn provides an important initial screening tool for genotoxicity in just minutes. The chip central to the device is disposable and costs only a dollar to make, thanks to recent advances in 3-D printing. “What we developed is very cheap to make, efficient, and can be used by almost anyone,” says UConn chemistry professor James Rusling, the senior researcher on the study. 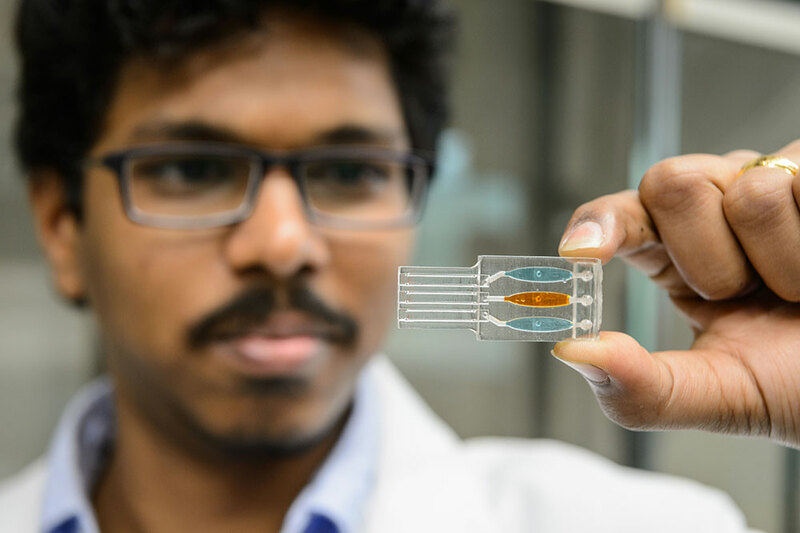 Affordable and efficient “labs on a chip” is a specialty of Rusling’s lab, which has previously created miniature arrays that can detect antibodies to food allergens and cancer biomarker proteins. Rusling says similar arrays could potentially be used for quick genotoxic screening during drug development, for monitoring or testing fresh water supplies, and for the early detection of aggressive forms of cancer. In the current study, the researchers extracted vapor samples from e-cigarettes and smoke from tobacco cigarettes using an artificial inhalation technique. Cigarettes were connected to a tube that contained a cotton plug. The researchers then used a syringe at the other end of the tube to replicate inhalation. Samples came from the chemicals captured in the cotton. The team set their test so that 20 puffs of an e-cigarette was roughly equivalent to smoking one tobacco cigarette, a ratio supported by other research. The team gathered samples at 20, 60, and 100 puffs. The potential DNA damage from e-cigarettes increased with the number of puffs, Kadimisetty says. There are potentially hundreds of chemicals in e-cigarettes that could be contributing to DNA damage, Kadimisetty says. Rather than test for all of them, the UConn team targeted three known carcinogenic chemicals found in tobacco cigarettes. They then loaded their device’s microwells with specific enzymes that would convert those chemicals into metabolites. If these chemicals were in the sample, the test gave them a reading for genotoxicity. If the chemicals were not present, there would be no reaction. The results caught him by surprise. Kadimisetty says he got interested in early cancer diagnosis and point-of-care sensors for genotoxicity after losing an aunt to cancer several years ago. His aunt, he said, might have lived longer had her cancer been detected sooner. Images used in this article are reprinted with permission from the journal ACS Sensors. Copyright 2017 American Chemical Society. 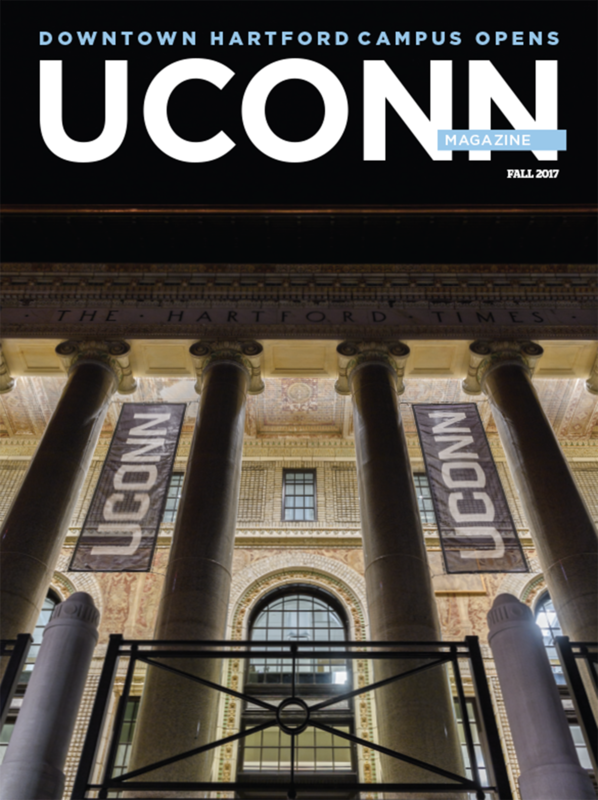 UConn chemists tested e-cigarettes and tobacco cigarettes for potential DNA damage caused by a known carcinogen (NNK) at different inhalation rates – 20, 60, and 100 puffs. Twenty puffs from an e-cigarette was deemed equivalent to smoking one tobacco cigarette. 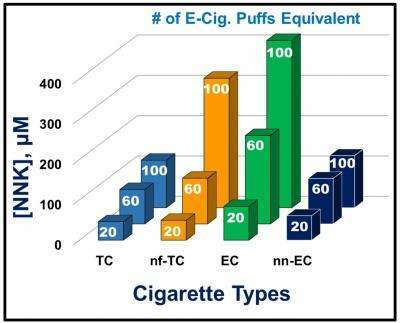 This chart shows DNA damage from nicotine e-cigarettes (EC) was approximately equivalent to damage caused by smoking unfiltered cigarettes (nf-TC). Damage levels increased with the number of puffs. Karteek Kadimisetty and the journal ACS Sensors. 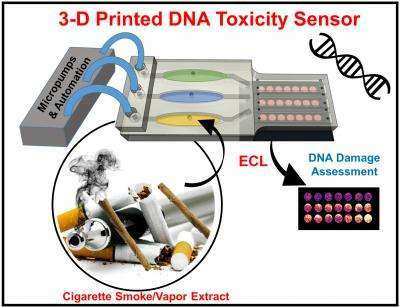 Small 3-D printed array created by University of Connecticut chemists quickly detects potential DNA damage from toxic chemicals.